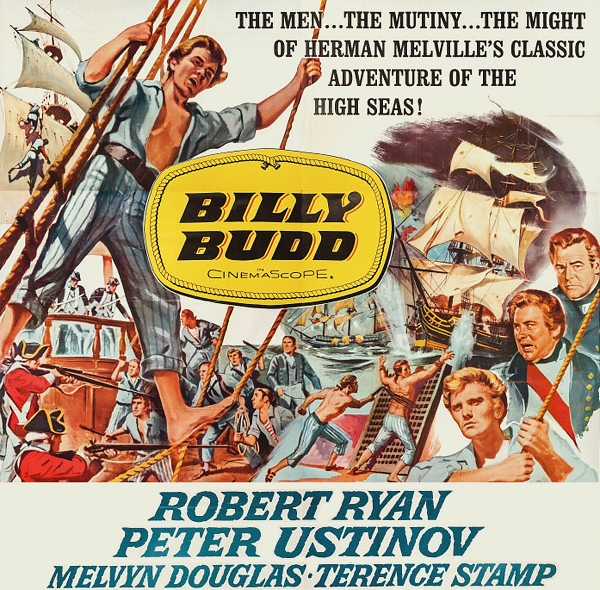 While this Billy Budd DVD cover looks exciting, It’s a safe bet that “Billy Budd”(V4) is a little more thrilling. Billy Budd, Sailor is a Herman Melville novel that was published in 1924. The book was acclaimed by British critics as a masterpiece and quickly took its place among the canon of significant works in the United States. You can read the book if you like, but you’ll probably find that climbing the boulder problem “Billy Budd”(V4) is a little more exciting. 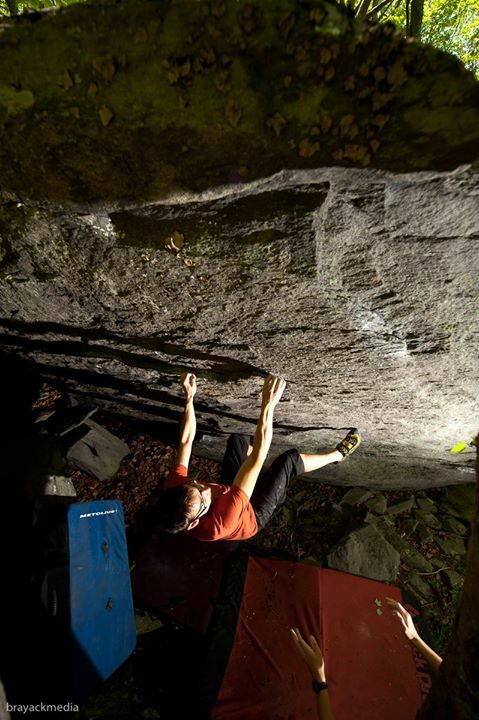 Matt Paden on “Billy Budd”(V4). Photo by Dan Brayack. like the bow of a sinking ship. To get there, follow the trail which cuts sharply to the right past the Thews Boulder. The trail drops through a wet-weather creek -plenty of stones to step across, so no wet shoes- and then turns left and uphill (look to your right to find the often overlooked Flat Top Boulder at this point) to end at the Belgrano Boulder, HMS Block, River Patrol Prow, and Gunslinger. Just as Melville’s novel is open to many interpretations, this line has several beta sequences that seem to work well for different climbers. 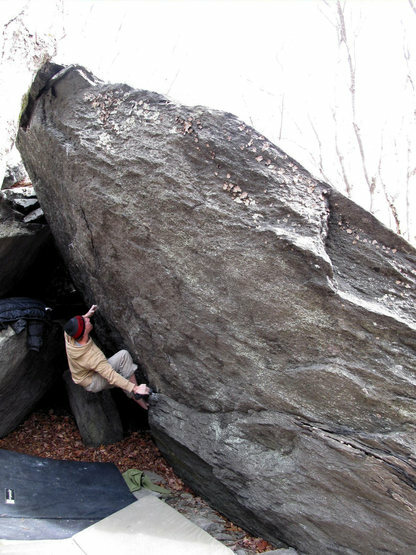 In general, Billy Budd begins matched on a large, deep in-cut jug feature in the low left, dark, steep corner of the face. The line follows several nice crimps, a long rail, and then smaller edges up and right passing beneath the close tree at the crux, and finishes over the flat lip into the sunlight. The Belgrano boulder, while not massive or highball, can certainly be exciting when negotiating the crux in front of the tree just before the lip. With a nice landing and a few pads this boulder problem is quite protectable however, and with a spotter can be climbed with confidence. The steep nature of theboulder makes this sequence a powerful one, and the edgy flakes can take a toll of your fingers. Bring plenty of skin if youre projecting this one! to try out “Billy Budd”(V4), “Rights of Man”(V5), “Belgrano”(V2), “Cannonade”(V2), “Gunslinger”(V7), or any of the other fun lines in the Right Boneyard. The Constant Boulder and the newly developed Rage Boulders (Rage Boulders are not listed in the 1st edition GHSP Guide) are likewise nearby. 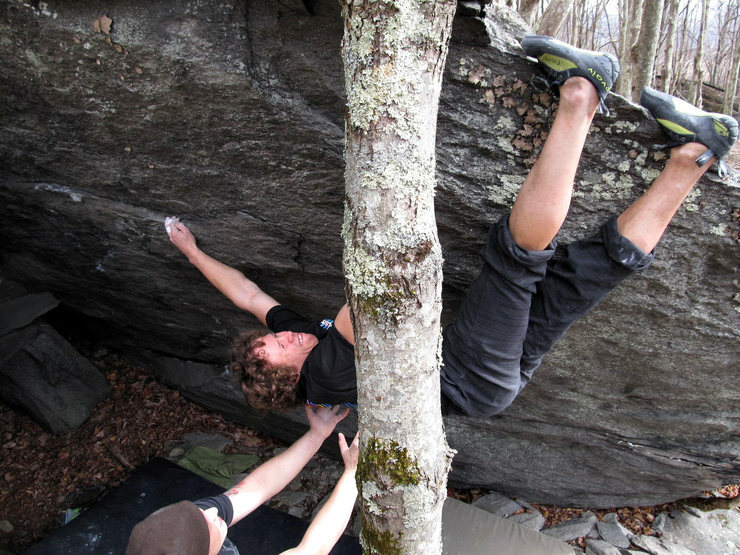 Check out the Mountain Project page for more area climbs here: http://www.mountainproject.com/v/-belgrano-blade/106703955 and pages 50-51 in the Grayson Highlands Bouldering Guidebook!